Great place. The staff is very nice, the bar and the breakfast are great. I would recommend this to everyone looking for a hostel in Montreal. Had a great time thanks to the awesome staff and atmosphere! A nice place to stay for a short time in town! Metro around the corner and at walking distance from places worthwile visiting. I slept in a single room with own shower and toilet. All basic, but practical design. Breakfast is included in the price. Samesun Montréal Central was overall a very good hostel. Extensive breakfast, free coffee throughout the whole day, a fantastic shower and the friendly and helpful staff were the most positive aspects of my stay. Only thing I missed was a padlock for my locker and they didn't have one for me at the reception. So make sure to bring one yourself if you want to use your locker. Great hostel! Staff is super nice, rooms are clean (though a bit crammed) and easily met other travellers! 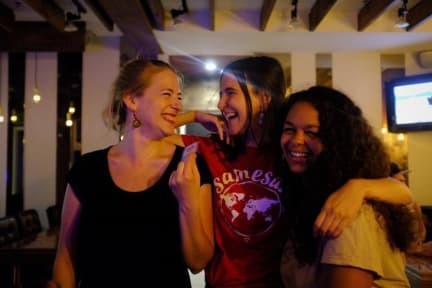 I loved my stay at Samesun Hostel! I came in sick as a dog, but it was no trouble to change my dorm room to a privet. Afterwards we had some very good parties: my birthday celebrations were amaaaazing! Everyone made sure I had the best time haha! If I had to name one downside, I have to say that the bar was not open. But that was a work in progress ;) thanks so much guys! See ya!